"The desert is merciless. It takes everything from you. " I honestly don�t understand all of the disdain surrounding George Lucas�s prequel trilogy. Taken on their own terms The Phantom Menace, Attack of the Clones and Revenge of the Sith are both perfectly enjoyable films and welcome additions to the Star Wars universe. I won�t blindly defend each and every decision that went into the prequel stories, but for every lame bit of dialogue and baffling plot device (medicloriants?) there are moments of rousing adventure and wonder that invoked that same sense of magic I felt while watching the original series as a kid. It�s all the more impressive considering I was in my 20s when the new films came out. Recapturing the magic was more of a daunting task and I was impressed that George was able to pull it off. Despite the flaws, I hold the prequel films in high regard and look forward to showing them to my own children (if I ever have any) one day. And for all the flak The Clone Wars has taken, I�m at a loss to explain why. Even if it�s not your thing, there�s absolutely nothing objectionable on display here. In this age of edgy, Anime science fiction, maybe this kid-friendly animation simply seems dull and tired. Hell, maybe I�m simply in the minority but I enjoyed The Clone Wars and, despite the lean storyline and jarring character designs, look forward to catching up to the ensuing television series. I�m not sick of Star Wars yet and if you�re in the same boat, I can�t see how anything about this CGI adventure could rub you the wrong way. The storyline is a race against time as Anakin Skywalker sets out to rescue Jabba the Hutt�s kidnapped son from a faction of droids controlled by the evil Count Dooku. The Jedi need to appease Jabba so to use his smuggler routes to circumvent the Trade Federation�s numerous blockades. Anakin is saddled with a new apprentice for the adventure, a rebellious and headstrong female called Ahsoka. Unsurprisingly, she takes direction about as well as Anakin and their mission is filled with light-hearted tension. Along the way there are space battles, a show-stopping cliffside siege of a remote fortress and a Jedi battle with new Sith apprentice, Ventress. It�s understandable that some viewers might express frustration over some of the silly attempts to appease the younger set. The droid army continues to be a big source of comedic relief as they�re frequently clumsy and stupid. Jabba�s kid is referred to as Stinky and The Clone Wars tries to get a lot of mileage out of his �cuteness� factor. This stuff isn�t necessary, but it�s all minor. If I had to offer up my own major gripe with this project it�s that we�ve already had two films and a cartoon series devoted to the Clone Wars. This movie represents a pilot of another Clone Wars-based television series and the upcoming live-action Star Wars series looks to be set in the 20 year period between Episodes III and IV. For such an expansive universe with unlimited creativity, George Lucas really seems to be limiting things here. I would absolutely love to see something set AFTER the original trilogy, or even thousands of years before Trade Federations and Clone Troopers. As I said, this isn�t a bad film but it�s a subject we�re already more than familiar with. Image Transfer Review: The look of this new Clone Wars series is decidedly different than any other incarnation of Star Wars that we�ve seen and while I didn�t love it, it doesn�t detract from enjoyment, either. This transfer is as stark as they come, giving you a first hand look at the sharp, blocky animation. There isn�t much extra detail to be gleamed from 1080p resolution, but the image is razor sharp, regardless. I don't mean to infer this transfer is disappointing, as it isn't. It simply illustrates the limitations of the animation. Audio Transfer Review: On the uncompressed audio front, I was expecting a lot more from this THX certified 5.1 TrueHD track. It�s aggressive and unimpressive all at once! Sound effects are meaty and pinball around the front and rear speakers depending on the action, whereas the musical score often falls flat � disappointing as I really enjoyed the new music cues. Dialogue is clear if just a tad on the underwhelming side. It�s not as though you have to constantly fiddle with your volume, but I would�ve preferred just a little bit more aggressive in this part of the audio. Extras Review: Video Commentary: Video commentary track with the writer, director, producer and editor. Their passion for the material is admirable and this is an enjoyable listen for anyone with interest in this series. This video commentary is exclusive to Blu-ray, although the video aspect adds very little to it. Star Wars-The Clone Wars: Untold Stories (24m:53s) is a nifty look at the entire Clone Wars series. I certainly intend to give this show a look as the episodes discussed here look much more promising than the film. Sure there's still some comedy (and Jar Jar Binks), but I was very impressed by what I saw. The Voices of Star Wars: The Clone Wars (10m) gives you a behind the scenes look at the largely new cast of voice actors giving life to their animated counterparts. Director Dave Filoni discusses his approach to directing his actors while encouraging their own creativity as well. There's a lot of love and passion for this project, Filoni comes off as a creative and likable guy and his cast does a terrific job with the material. A New Score (10m:45s) is an interview with composer Kevin Kiner and his approach to 'reinventing' the Star Wars theme while providing his own unique spin. Kiner's score is a little bit of new and a little bit of old. It works very well and this featurette nicely showcases the impressive work put into scoring The Clone Wars. Deleted Scenes (10m:04s): A collection of four decent deleted scenes that seem to have been cut for pacing reasons more than anything. There's more battles with the droid armies and a rollicking light saber duel between Anakin and Ventriss. If anything, these SD scenes illustrate how wonderful this Blu-ray transfer looks. Webisodes: Six short promotional pieces that delve into the various aspects of the project, from its ambitious scope to the addition of several new characters. Now that the film is out and the show is running, these do little do excite. Gallery: A collection of concept art and sketches. Two theatrical trailers and a trailer for the video game are included. One of those newfangled digital copies comes on a second disc. Some may enjoy this addition, but I find it to be a colossal waste of time. At the very least, Warner isn't advertising this as a two disc special edition like every other company out there. So, thanks for that! 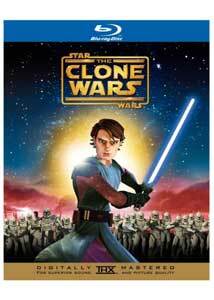 The Clone Wars arrives on Blu-ray with a solid slew of extras, great video quality and decent uncompressed audio. If you missed this in theaters and enjoy Star Wars then this is a title worth checking out. If only because it serves as a gateway to a potentially more interesting television series.